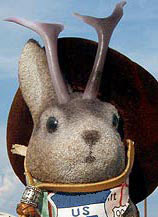 Happy Easter, 2009. I've been saving this. Just pretend you found it in your Easter basket. 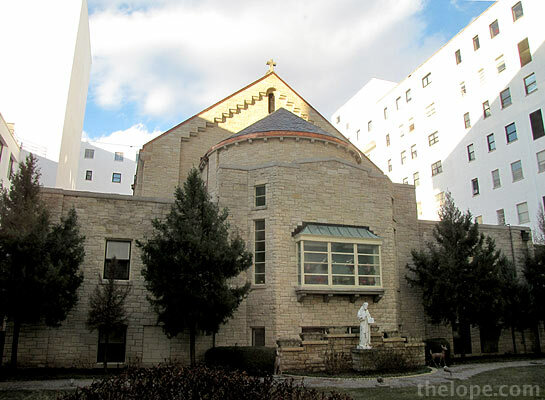 During my friend Patsy's recent stay at Via Christi hospital's St Francis Campus in Wichita, Kansas, a late-night walk led me to a chapel of unconventional beauty. Now, to preface this I should set the scene. 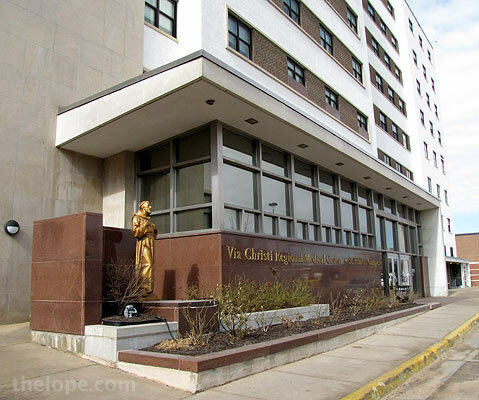 Via Christi is a fine hospital in my experience. The building suits its purpose well and the atmosphere and quality of service actually reminded me of an upscale hotel (with the added service of slicing your friend open and removing bad things). It's a fine building with some interesting views and some older parts visible on the outside, yes - but hardly riveting in any respect. 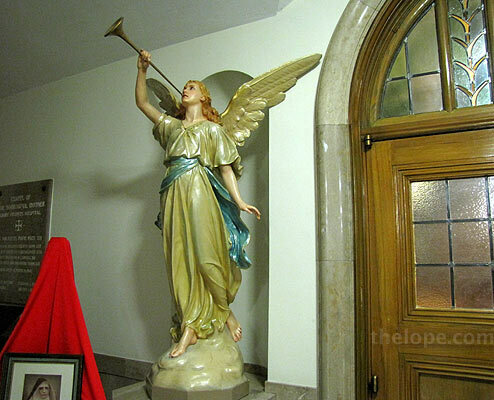 So, with Patsy asleep, I went to see what the hospital chapel looked like. I'm not sure why, even to this day. Maybe three weeks of wondering if my best friend had cancer, followed by the relief that she probably did not, made me want to go somewhere solemn. 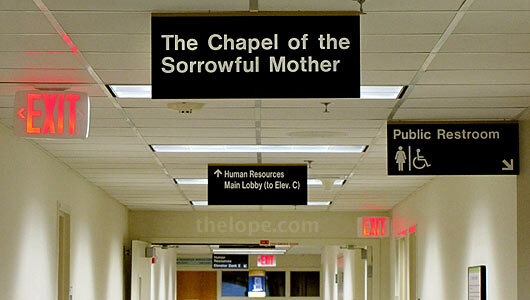 Human Resources - Main Lobby - Public Restroom - The Chapel of the Sorrowful Mother. I still find something funny about the grouping of such a distinctive name with such generic ones. 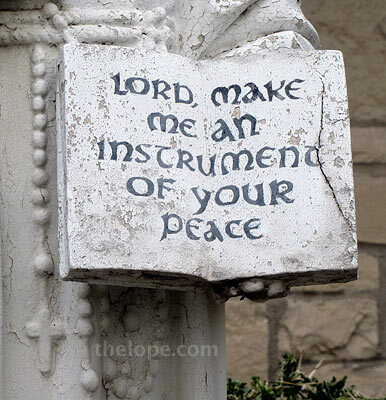 And I'm not Catholic and am pretty sure my mom is happy, but, man, that is one guilt-inducing name. The sign doesn't do the place justice. The change from institutional sterility to age and character is sudden and jarring. And I swear there must be a distinct audio signature for footsteps in a church or school hallway. 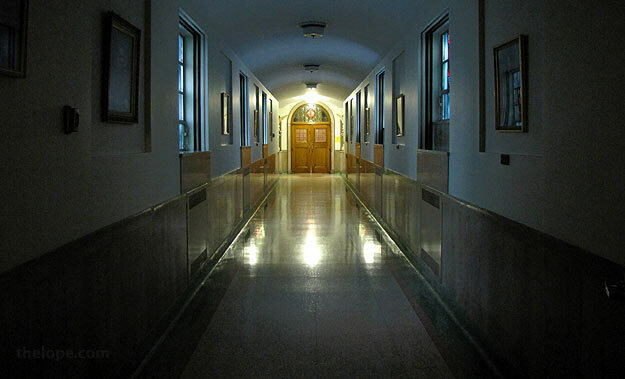 Maybe it was the sense of trespassing that comes with wandering abandoned corridors, but I felt rather as if I were reporting to the principal's office. 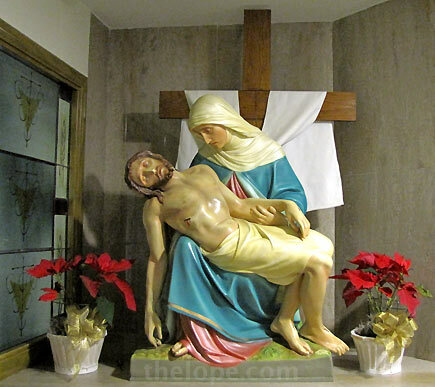 Just inside the corridor is a pieta-like sculpture. I actually felt like I was intruding on a moment of grief - like my gaze should not linger. 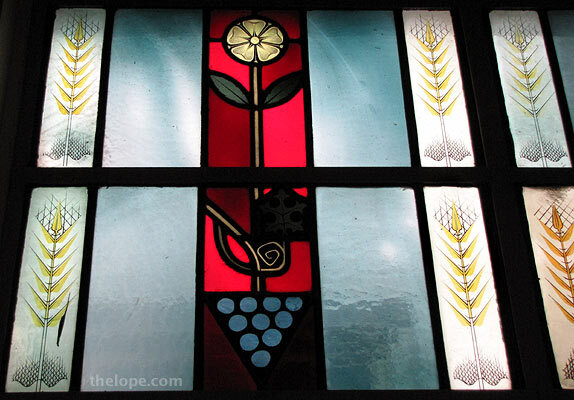 On the windows to the left you'll see what looks like a mid-century modern graphic, possibly of grapes and a cross - my first clue I was in for a stylistic treat. 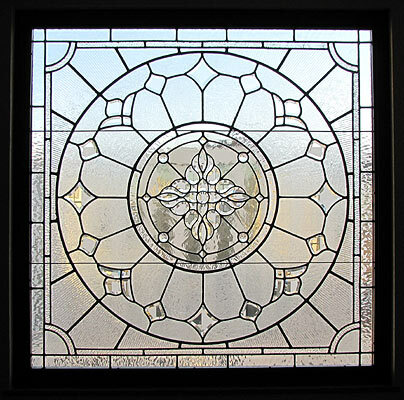 Stained glass windows with a Kansan feel line the corridor. I assume the yellow stalks to be wheat. The grapes are obvious, but I don't know if the flower is intended as a sunflower or any specific type. 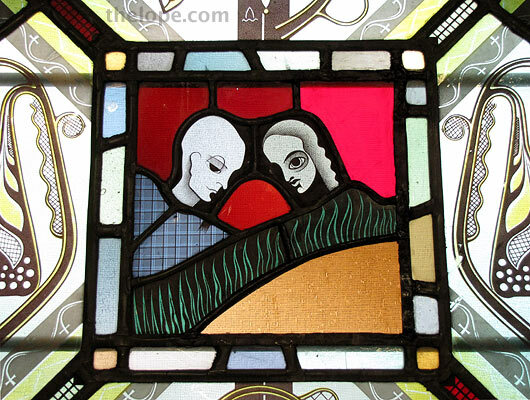 This gave a hint of the stained glass inside - stay tuned for that. 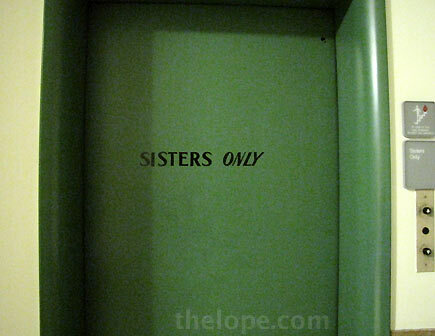 An elevator door of a green usually found in the memories of grade school hallways bears the warning, SISTERS ONLY. Of course, respect and that still-lingering sense of trespassing are one thing and curiosity, another. So I pushed the elevator button. 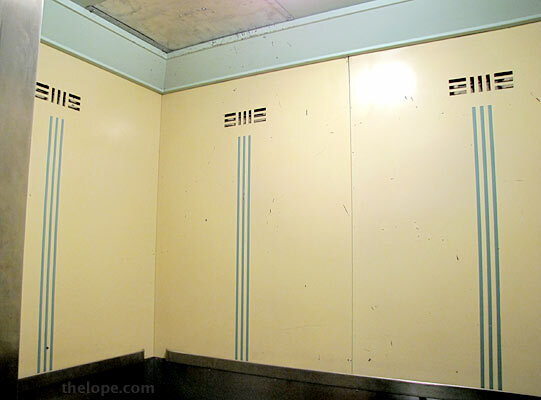 I think the interior louvers smack of Art Deco. 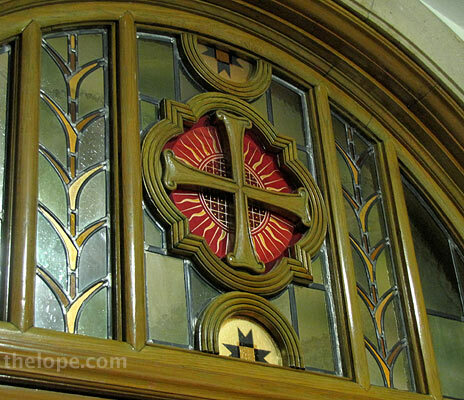 There is some glass and woodwork above the door. But that's as far as I got the first night. 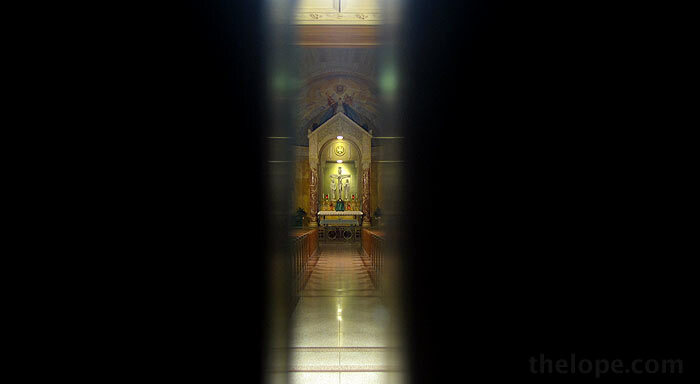 I was left with this enticing view through the crack between locked doors. I was quite excited. I had no idea there was room for anything of this apparent size and age in this modern hospital and had expected at the end of the corridor to find a room about the size of chapels I'd seen in other hospitals - rooms about the size of a corporate board room and modestly decorated. Looking through that crack was like a trick of depth perception and lent to a sort of Raiders of the Lost Ark feel. 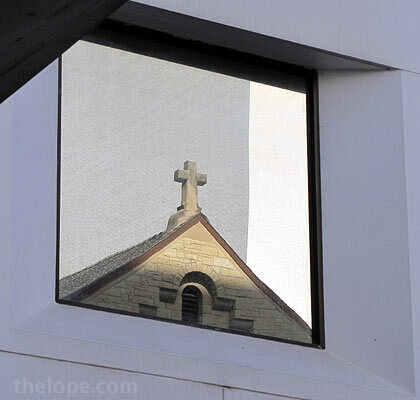 I had assumed from outside views that Via Christi was a large cubic mass and not what it really is - a rectangle, the sides of which are joined buildings of various ages. 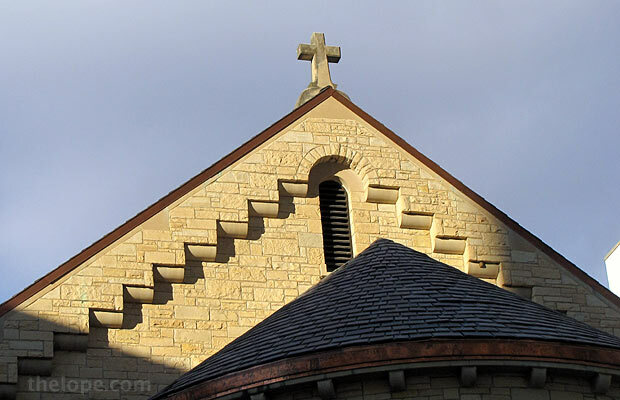 This substantial church must lie hidden at the center. Hidden, indeed. 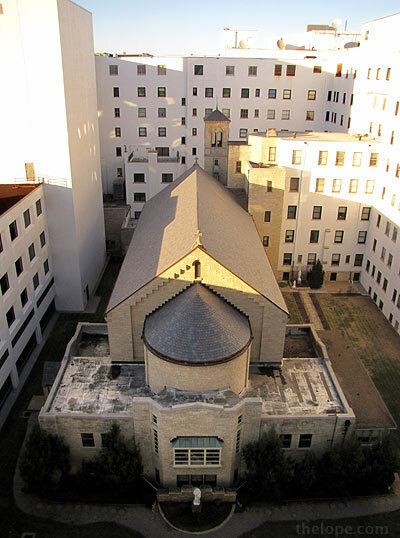 The Chapel of the Sorrowful Mother has been totally surrounded by the growth of Via Christi and its predecessor, St Francis hospital, for which it was built in 1947. You can see the connecting corridor at lower left. 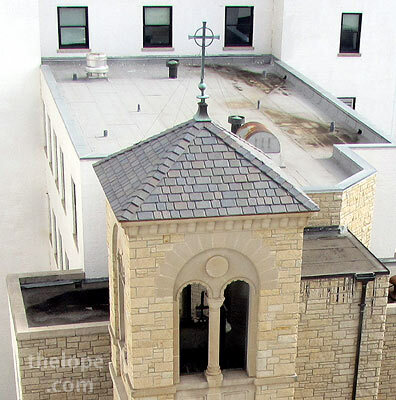 It is an odd thing to look down on a steeple. 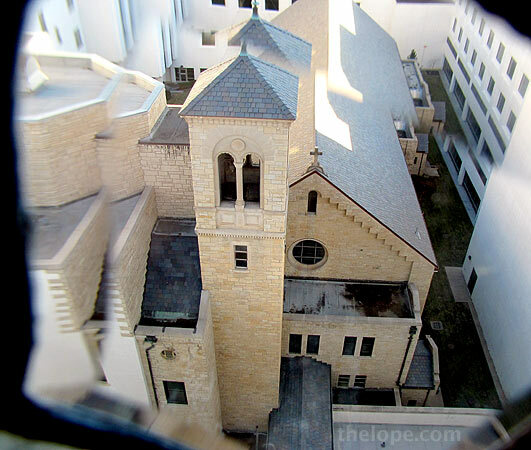 The best view I found of the front of the chapel was afforded through the clearer parts of a decorative window, looking south from a waiting area of the Harry Hynes hospice on the 8th floor of Via Christi. 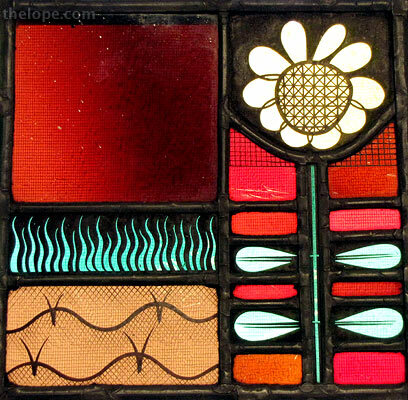 I also like this semi-prismatic view. This is a view looking north from a window in Via Christi. 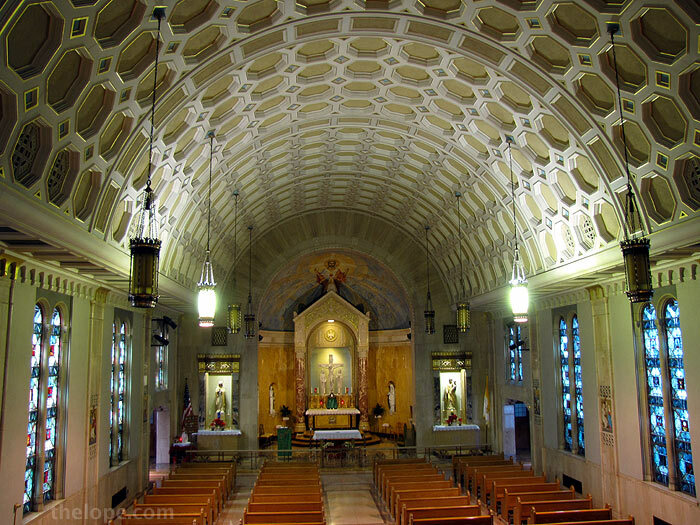 The architects, by the way, were Maguolo and Quick of St Louis. 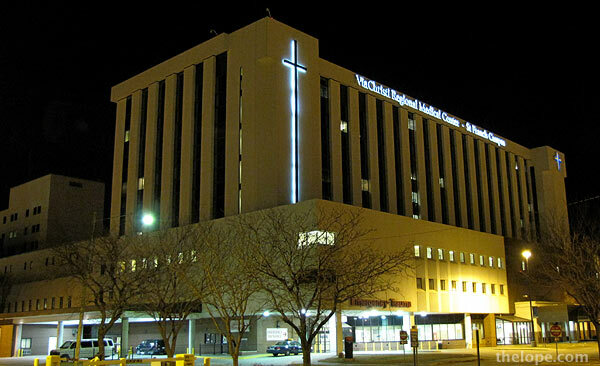 And here is a night view, looking west with Broadway (highway 81) beyond the hospital. This was shot from a stairwell window. 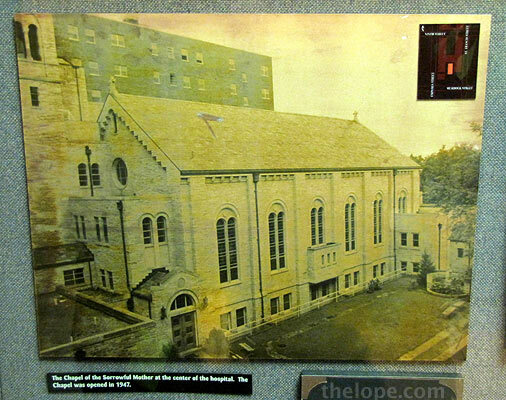 An exhibit in one of the hospital corridors shows a photograph of the chapel when it was surrounded on only three sides. 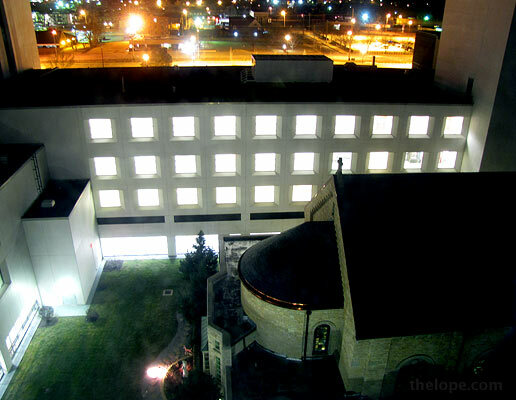 The day after I was stopped by locked doors, I managed to make it there during open hours. 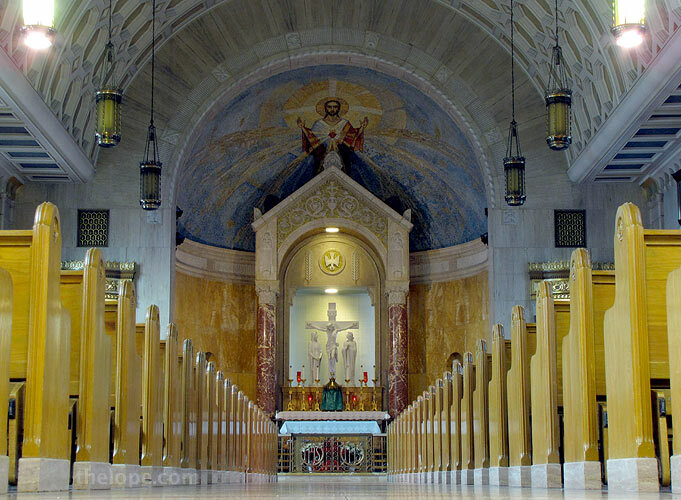 The chapel was empty as it almost always was in subsequent visits. Note the use of coffers - those sunken ceiling panels - to reduce weight. 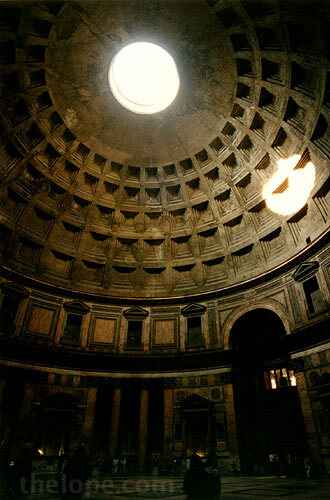 The same technique was employed by the builders of the Pantheon in Rome. One can easily forget one is in a hospital, and the generic sign outside seems ludicrously inadequate as an indicator of what's in here. 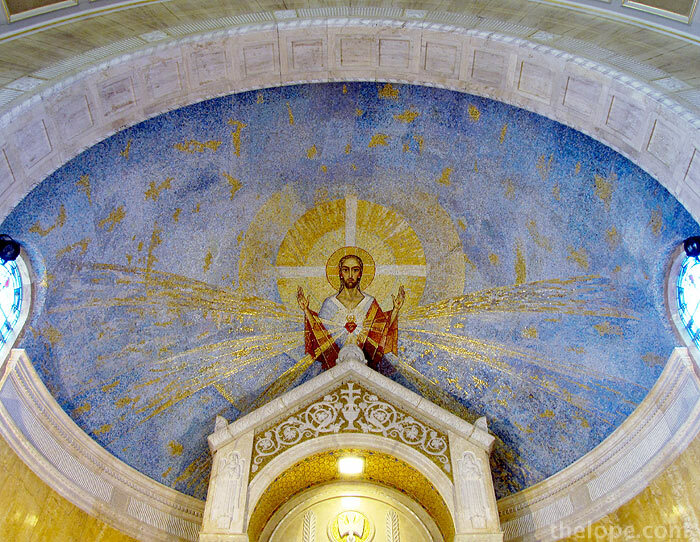 At the front is a domed mosaic. A hospital display states that it was paid for by employee donations. There's the statuary you'd expect in such an ornate place. 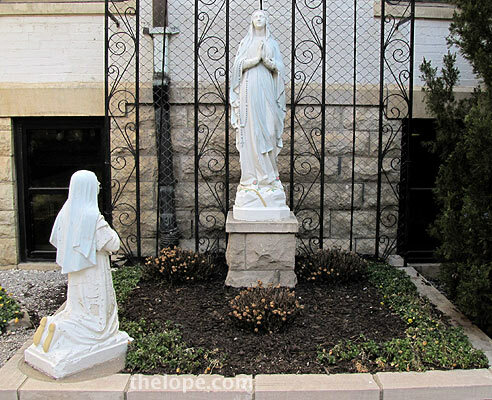 That's Mary and St John with Christ. 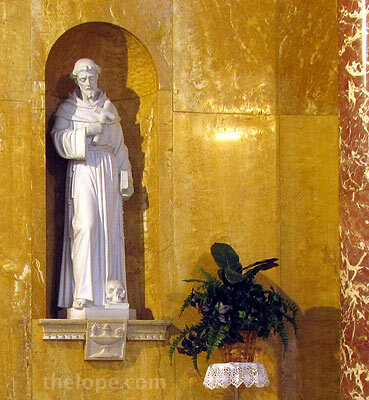 I was puzzled by this statue of St. Francis of Assisi with a skull at his feet. 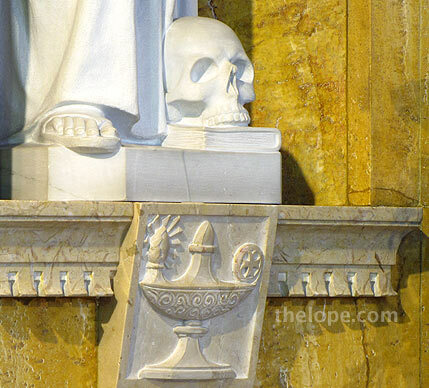 Sister Sherri Marie Kuhn of Via Christi tells me the skull represents death, which he embraced as a sister. 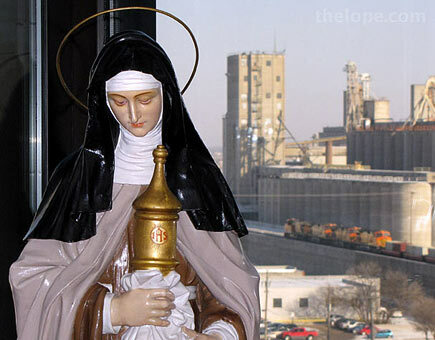 She advises reading St. Francis' poem, "Canticle of the Sun" to understand this in context. 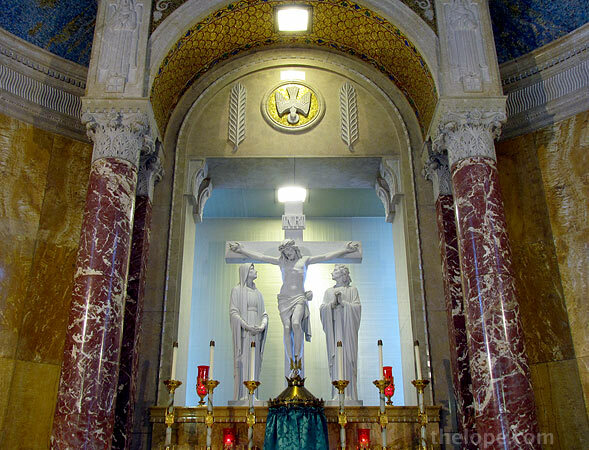 There are mosaics of the stations of the cross. 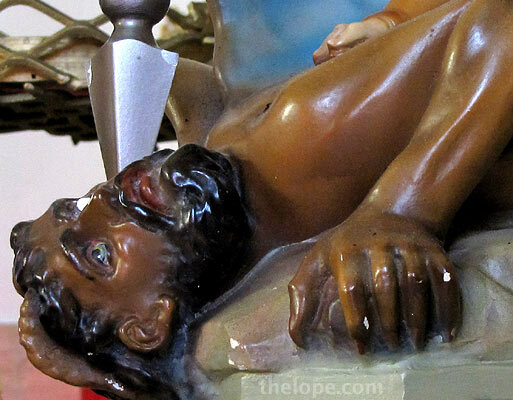 This is the sixth station, "Veronica wipes the face of Jesus." I'm not Catholic and am unfamiliar with stations of the cross so I did a little reading. 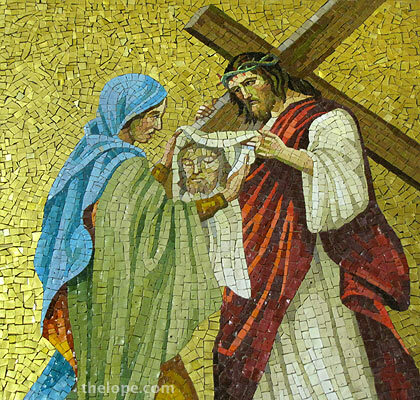 Apparently legend has it that while Christ was carrying his cross, a woman named Veronica (some sources state the name means "true image"), moved with pity, used her veil to wipe the sweat and blood from his face. 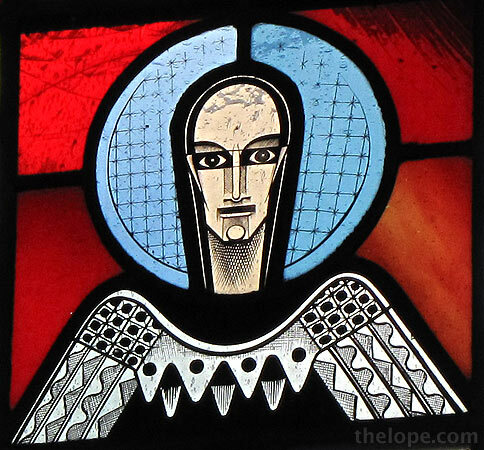 As the mosaic suggests, his image was left on the veil. I don't know the age of this legend but it might have interesting ties to the belief that there is an image of Christ out there somewhere, as in the Shroud of Turin. 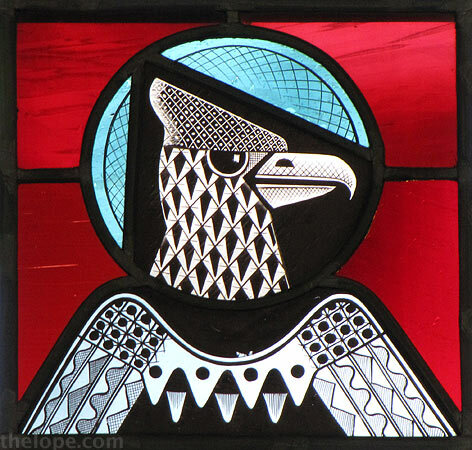 I was not able to find out the name(s) of the artist(s) who did these, or the domed mosaic. If anyone can provide a source on this, please comment. 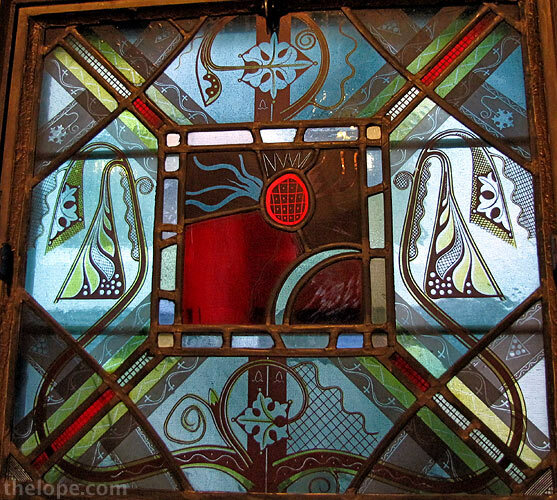 It was the stained glass windows that I found most intriguing. 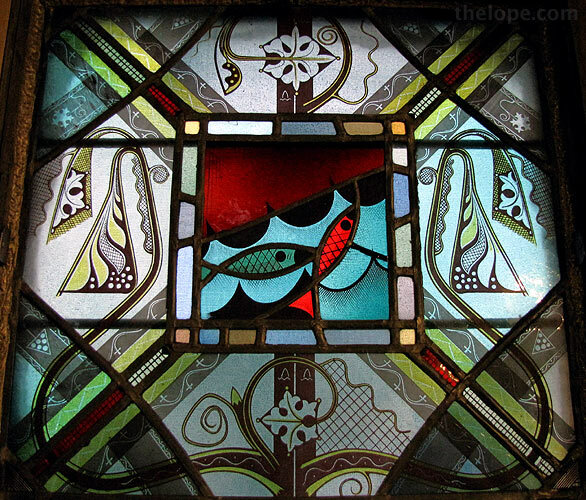 They have echoes of both Art Deco and Art Nouveau, though both styles were past their prime in 1947. 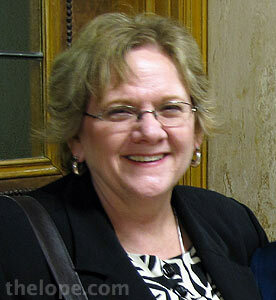 Sister Sherri Marie Kuhn believes this one to be either Mary, Queen of Prophets or Mary, Queen of Patriarchs. 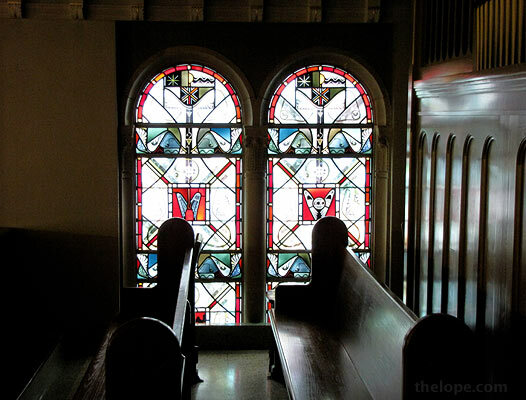 All of the stained glass windows in the chapel, including those in the connecting hallway, were made by the Emil Frei Company of St Louis, a 111 year-old family company that is still in business using very old techniques. They made the "space window", which actually contains a sliver of moon rock from Apollo 11, for the Washington National Cathedral. Ironically, the Emil Frei website was blocked by Via Cristi's Internet filters when I was there in late January. I do not know why as there is nothing remotely objectionable on the site, though it is incomplete. 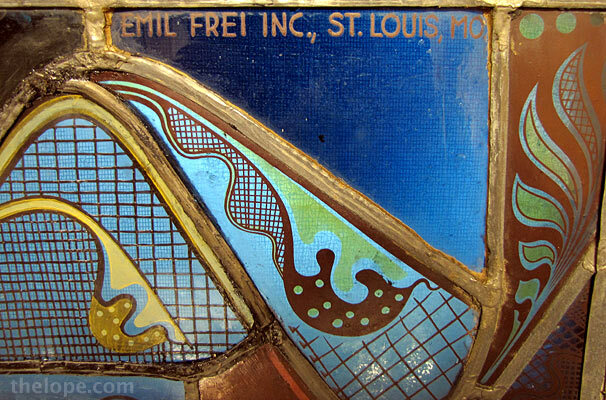 I phoned the company and spoke with its president Stephen Frei, 55, the great-grandson of founder Emil Frei. 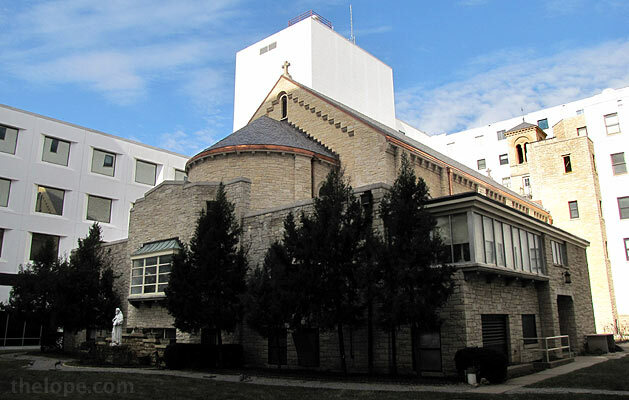 He did not know anything about the Chapel of the Sorrowful Mother as it was before his time and he had no detailed records of it, but it was a fascinating conversation about the what he called the "15th century cottage company." "We're part of a dying breed" he said. 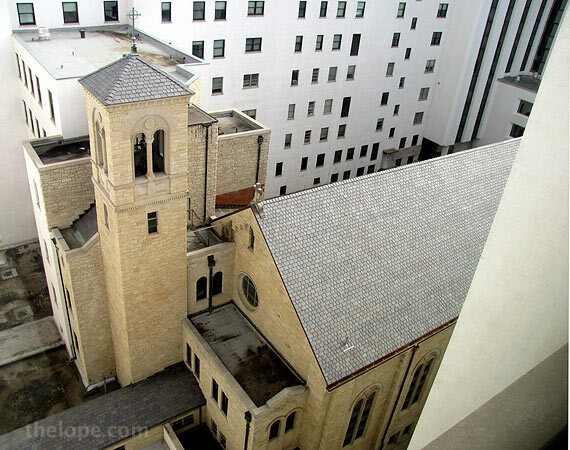 He mentioned that Emil Frei company also did windows for other Wichita area churches including Saint Ann's and Church of the Resurrection. 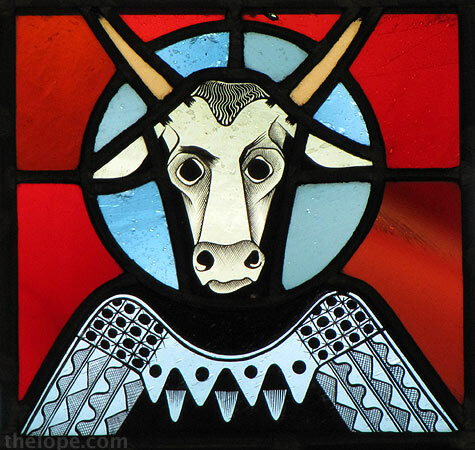 On a tangent too interesting not to mention, Stephen Frei mentioned that not all members of the family went into the stained glass business. There was one black sheep, he joked, and told me of his relative, Emil Frie III, a pioneer in Chemotherapy who developed the first treatment that led to a complete cure for childhood leukemia. 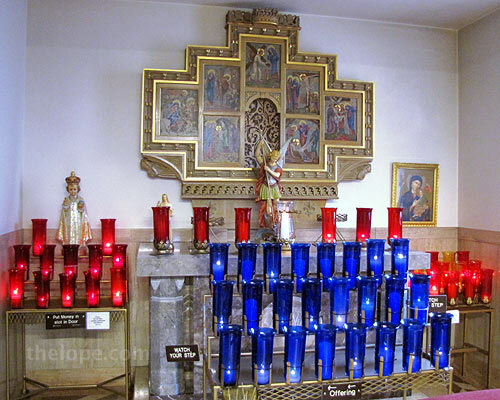 The first row represents the Symbols of the Joyful Mysteries. 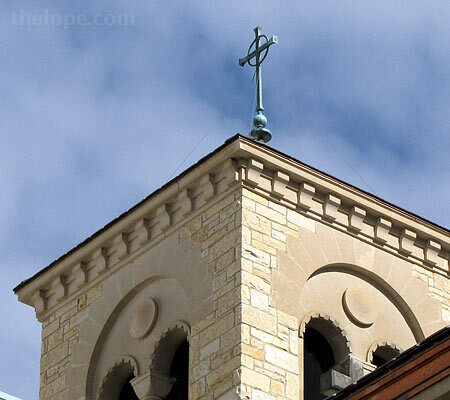 The second tier is the Symbols of the Litany of the Blessed Virgin Mary. 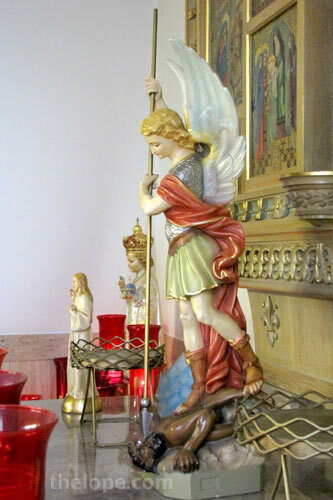 The third tier addresses the Virgin in her role as Queen of Heaven and Earth. 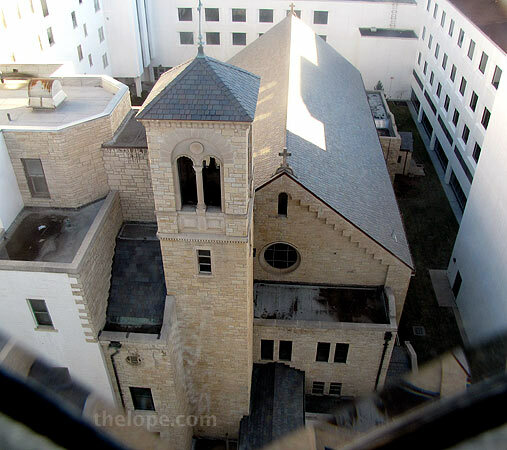 The bottom tier is the Ave Maria or Hail Mary. 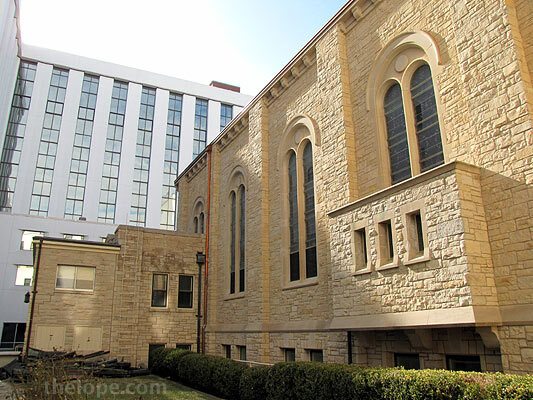 The windows on the right (west) are the Epistle side and go from the front of the Chapel toward the back. 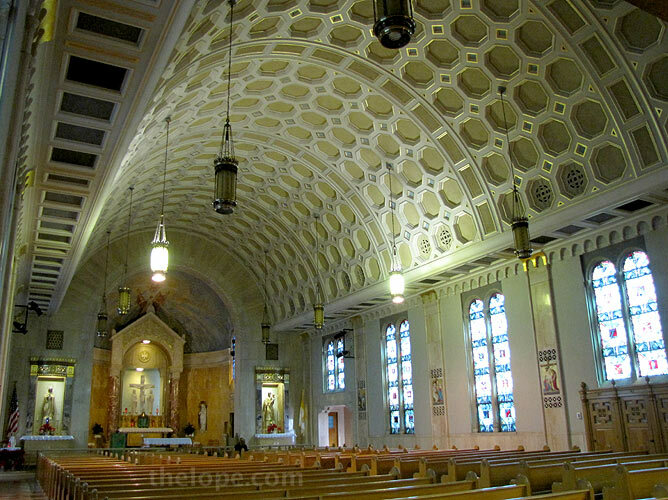 The first row symbolizes the aspects of Catholic teachings. 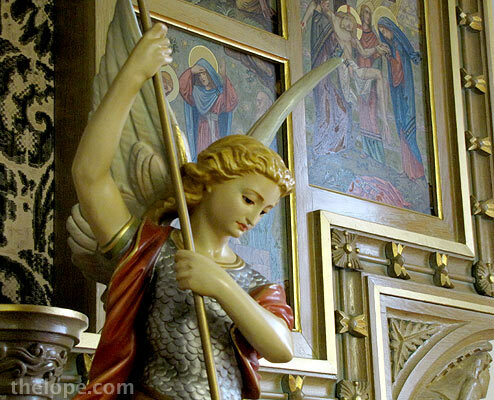 The second tier is Outstanding Saints of the Church. The third tier is the Sacraments. The fourth tier: primeval history, how God created heaven and earth"
Going from this information, I believe this panel in the primeval history series might have to do with the creation of the world. In the same row, I assume these are the fish of the sea. Also in the primeval series, this panel looks particularly Kansan. It's funny how any sufficiently abstract graphic works like a Rorschach test. I look at the part at lower left and see barbed wire fences. I doubt that was the intent. They are growing crops, perhaps? This panel would be "mankind." 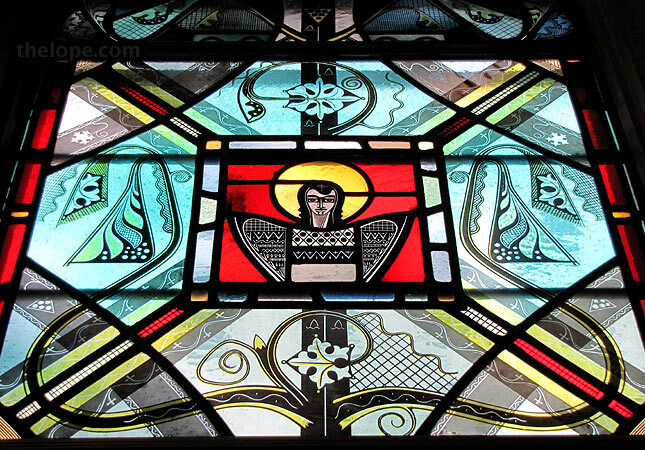 In what I would later learn is the "Outstanding Saints of the Church" tier are four images, a man, a horned animal, a lion and a bird - all wearing what looks like armor - that particularly intrigued me. 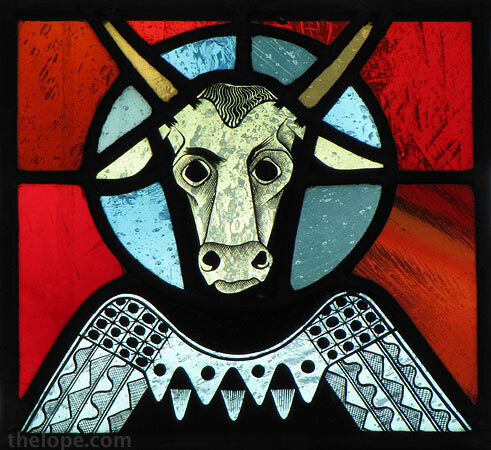 The lion, calf/ox/bull, man and eagle quartet shows up a few times in the Bible and ancient theologians seemed intent on assigning the four animal identities to the writers of the four gospels. Before I knew they were supposed to be saints, I called on what little I know of the Bible and remembered a bit of Revelations (4:7-8 - Yes, of course I had to look it up): "The first creature was like a lion, and the second creature like a calf, and the third creature had a face like that of a man, and the fourth creature was like a flying eagle." 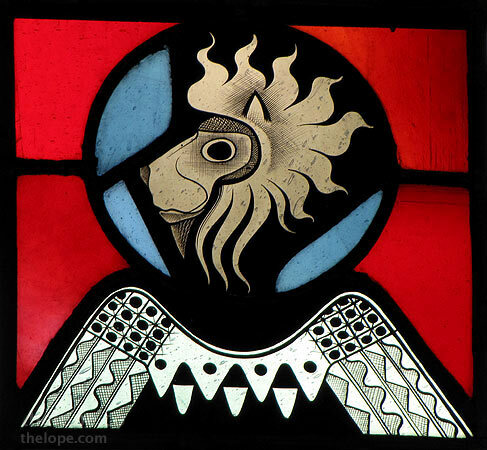 Since they are saints (the halos would be a dead give-away even without the brochure information), the man is Matthew, Mark is the lion, the ox is Luke and John is the eagle. I should note that in my limited reading on this, that the exact assignment of symbolic animal to apostle varied with different theologians, though those listed above seem the most accepted. Corrections are invited. 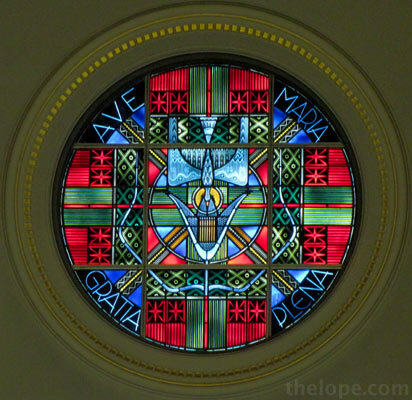 The circular stained glass window above the loft reads "Ave Maria Gratia Plena", which translates as "Hail Mary, full of Grace." 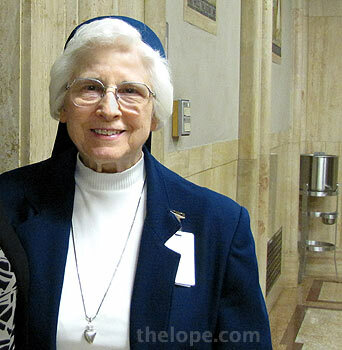 Sister Janice of Via Christi took us up into the loft using that "sisters only" elevator. The loft was added sometime after original construction and partially obscures bits of two windows. But it does afford a good view. 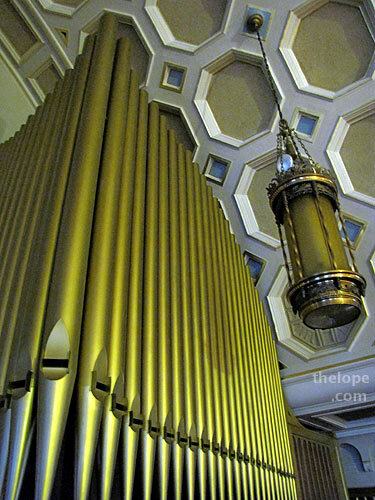 Here's a close-up view of those coffers, along with the organ pipes. 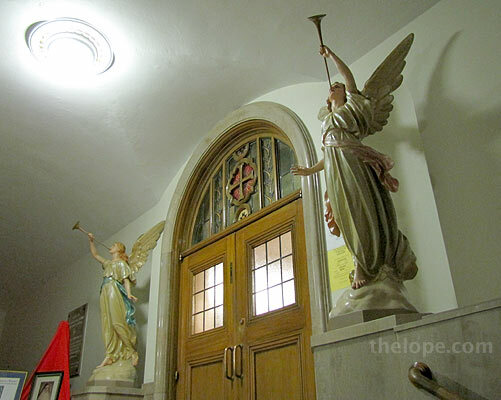 Outside the entrance hallway to the chapel is a small museum, though its information about the chapel is minimal. 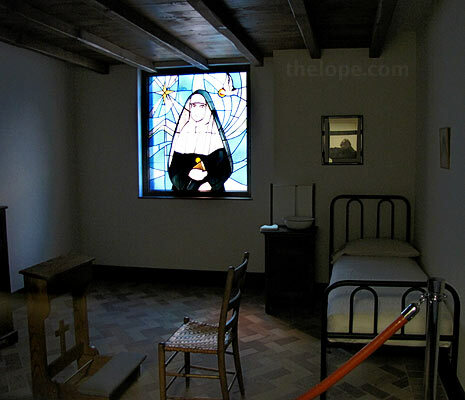 It does have a stained glass of the order's founder, Mother Francis Streitel and replicates her quarters. it is open only on Thursdays for limited hours. 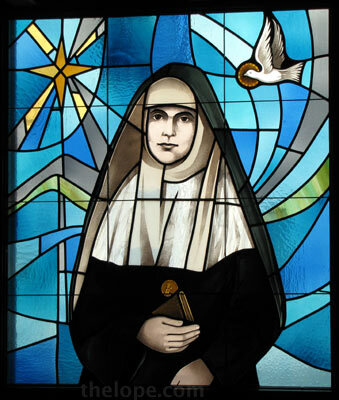 Right before Patsy's release from Via Christi and the end of my time there as a visitor, I found a way out onto the grounds around the chapel using a door in a glass hospital corridor. That door would not let me back in and I found a long way around, though I'm not sure that's the norm. It is an odd thing, seeing the older reflected in the newer. 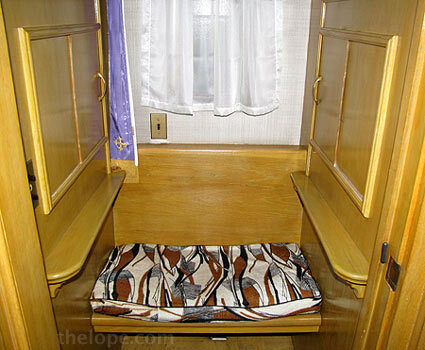 The rectangular projection at right is the confessional. 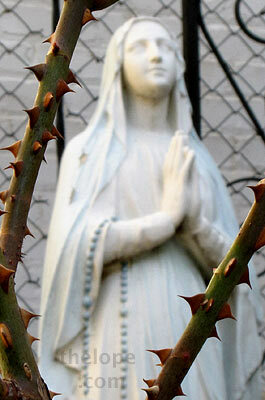 Rose bushes awaited the Spring with a statue of Mary in the background. 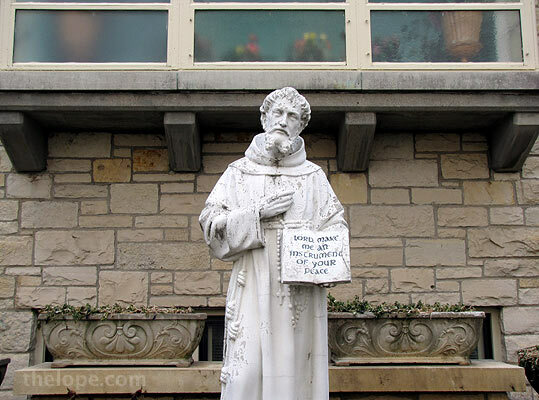 A statue of St Francis carries a message. Other exterior views are here, here, here and here. 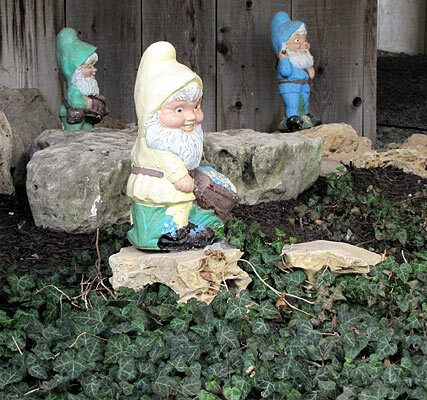 As I left the courtyard, a set of garden gnomes seemed to look on. 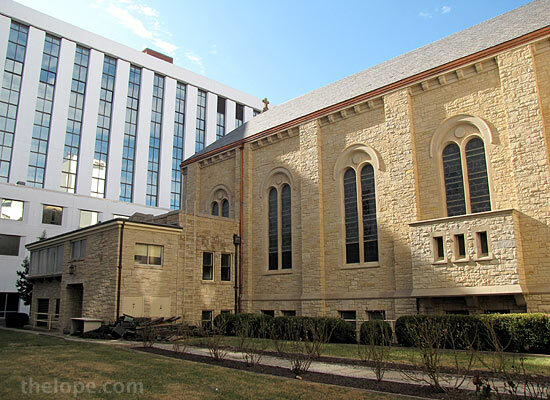 The closest entrance to the chapel is at the northeast corner of Via Christi on the east side. Parking is limited and dedicated to patients for specific purposes, so you might want to use the parking garage and walk, or simply go through any hospital entrance. Just awesome pictures, Greg, as always. Thanks for the beautiful shots. Thank you for these great photos. 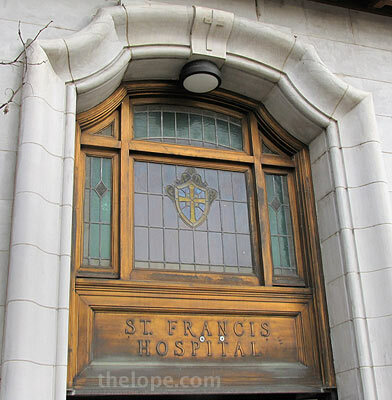 I visited patients at St. Francis back in the 70s and 80s when I was a Lutheran pastor in Chanute, KS. Via Christi had not entered the picture back in those days, but I do remember seeing the church surrounded (at least in part) by the hospital. I didn't take the time or make the effort to see it in detail or learn about it, however. Now you have shown me that I missed much. 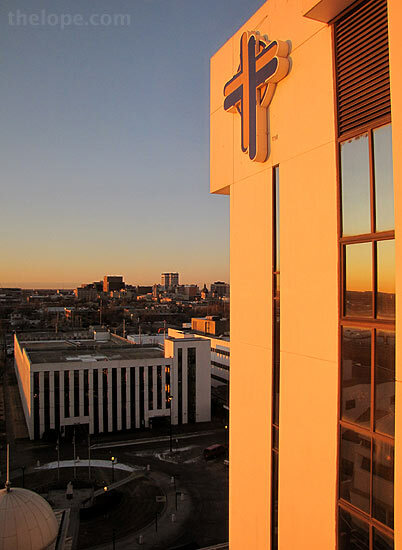 What a gift to those of us who may never have an opportunity to visit the church/hospital there. The photographs are magnificent, and posting this for Easter week was a perfect time.